For many reasons, this year Pride is more important than ever. Not only is it a celebration of life, love, and spirit, it is an affirmation of our values as we face potentially devastating policy changes and ongoing heartbreak on the international level. Many of these events remind us that the LGBTQ community is still at great risk. Pride works to combat negative ideas and stereotypes while providing a safe place for the LGBTQ community to get together. On a larger scale, it’s an opportunity for our community to join together to end violence and intolerance against the LGBTQ community worldwide. 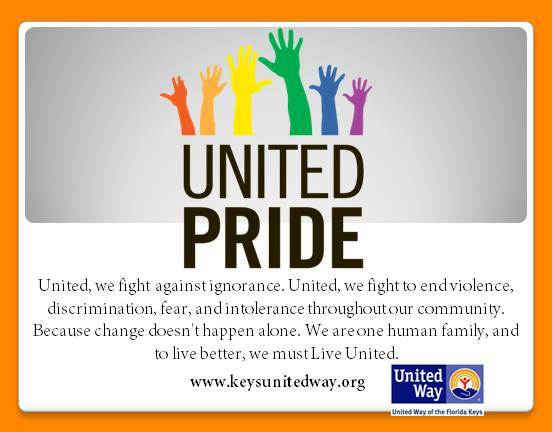 The Florida Keys and our local United Way are proud of our diversity. We celebrate Pride, and the work our community does to overcome bias, intolerance, and fear. This year, we celebrate pride in our identities. We celebrate our character and strength in overcoming obstacles. We remember our loved ones and community members who are no longer with us because of discrimination and violence. This year, Pride should be a reminder that we all need to watch out for one another, taking extra care to protect our LGBTQ community members who are minorities, those with disabilities, and others who are at increased risk for violence and harm. Together, we can make change. Together, we are stronger. Together, we Live United.